Below you fill find all funeral homes and cemeteries in or near Fanwood. 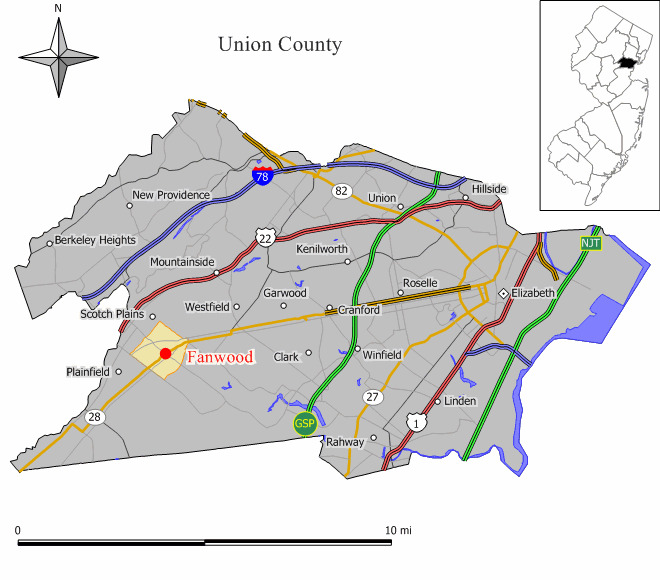 Fanwood is also known as: Union County / Fanwood borough. Their current mayor is Mayor Colleen Mahr. Zip codes in the city: 07023. Some of the notable people born here have been: Derrick Caracter (basketball player). Fanwood is a borough in Union County, New Jersey, United States. As of the 2010 United States Census, the borough's population was 7,318 reflecting an increase of 144 (+2.0%) from the 7,174 counted in the 2000 Census, which had in turn increased by 59 (+0.8%) from the 7,115 counted in the 1990 Census.Fanwood was incorporated as a borough by an Act of the New Jersey Legislature on October 2, 1895, from portions of Fanwood Township (now known as Scotch Plains), based on the results of a referendum held the previous day. The borough was named for Fannie Wood, an author. It was noted by Kalamazoo Gazette on October 26th, 2016 that Robert H "Bob" Angle passed on in Lawton, Michigan. Angle was 84 years old and was born in Fanwood, NJ. Send flowers to share your condolences and honor Robert H "Bob"'s life. It was revealed on May 14th, 2011 that Sophie Gorne died in Fanwood, New Jersey. Gorne was 98 years old. Send flowers to express your sorrow and honor Sophie's life. It was noted by Ocala Star Banner on September 11th, 2009 that Elizabeth B Ward (Brown) passed on in Ocala, Florida. Ms. Ward was 94 years old and was born in Fanwood, NJ. Send flowers to express your sorrow and honor Elizabeth B's life. It was noted by Ocala Star Banner on September 10th, 2009 that Elizabeth B Ward (Brown) died in Florida. Ms. Ward was 94 years old and was born in Fanwood, NJ. Send flowers to express your sympathy and honor Elizabeth B's life. Fanwood is a Borough (New Jersey) in Union County, New Jersey County, New Jersey, United States. As of the United States 2000 Census, the borough population was 7,174. . . . The official website for the city of Fanwood is http://www.visitfanwood.com/. Driving Directions . Memorial Funeral Home 155 South Avenue Fanwood, NJ. 07023 Phone: 908-322-4350 Email: Get Map. From Northern New Jersey: Garden State Parkway to Exit 140a. Listing all funeral homes in Fanwood, New Jersey so you can easily send flowers to any location (same day delivery) or find any funeral service. We work with local florists and flower shops to offer same day delivery. You will find budget sympathy flowers in Fanwood here. Our funeral flowers are cheap in price but not in value.